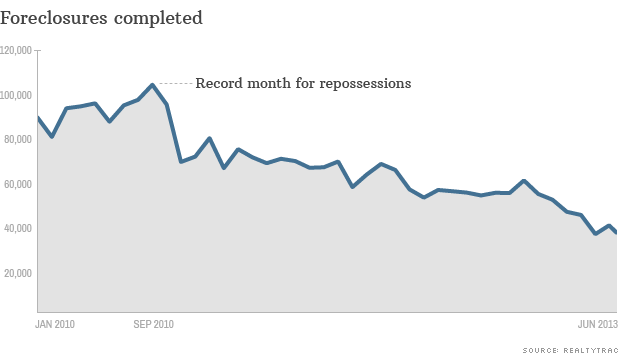 In June, foreclosure filings dropped to their lowest level since before the housing bust. The long national foreclosure nightmare is nearing its end, with foreclosure filings hitting their lowest level since before the housing bust. Total foreclosure filings, including notices of default, scheduled auctions and bank repossessions, dropped to 127,790 in June, down 35% over the past 12 months, according to RealtyTrac. Overall, filings have hit their lowest monthly level since December 2006. The number of foreclosure filings have plunged so fast -- down 14% since May -- that the housing market could be back to pre-mortgage meltdown levels before the end of the year, according to Daren Blomquist, a vice president at RealtyTrac. "Halfway through 2013 it's becoming increasingly evident that foreclosures are no longer a problem nationally, [although] they continue to be a thorn in the side of several state and local markets," he said. The five states with the highest percentage of foreclosure filings last month were Florida, Nevada, Illinois, Ohio, and Georgia. In Florida, Miami, Orlando, Jacksonville, Ocala, and Tampa held the top five spots for filings among the nation's metro areas. While initial filings for foreclosures dropped by 45% year-over-year to a seven and a half year low, the number of homes that were further along in the process and were repossessed have not fallen as quickly. "[At the last stage of foreclosure] they trail other filings," said Blomquist. Bank repossessions are still trending at a rate of more than 420,000 a year, compared with a historical average of 250,000, said Blomquist. Many of these repossessions are occurring in states where courts supervise the foreclosure process and they are just now working through a backlog of foreclosures that built up after the so-called robo-signing scandal. "The increases in judicial foreclosure auctions demonstrate that these delayed foreclosure cases are now being moved more quickly through to completion," said Blomquist. "Given the rising home prices in most of these markets, it is an opportune time for lenders to dispose of these distressed properties." And as home values rise nationwide, more homeowners are able to keep their homes or sell them before they lose them to foreclosure.